The objection that life can't survive in space needs examination. A serious problem for Svante Arrhenius's theory in 1908 was that spores in empty space would be subject to radiation damage, especially in the vicinity of a star. In 1978, Hoyle and Wickramasinghe observe in Lifecloud (1) that if a cloud of bacterial matter were dense enough, the inner contents would be protected from radiation by the outer layers. Other scientists have recently observed that a coating of dust only half a micrometer thick would adequately protect a bacterium from ultraviolet radiation in space (2-4). Hoyle and Wickramasinghe also discuss another means of space travel which solves the radiation problem: comets. And even before that danger was known, the idea that comets could contribute to life on Earth was afoot. Among others, Isaac Newton endorsed it. "Newton considered the continual arrival of cometary material to be essential for life on Earth" (5). Comets, as astronomer Fred Whipple figured out, are made largely of ice. Much of the ice in comets is frozen water, but ices of other compounds such as carbon monoxide and carbon dioxide are also present. And comets contain, we have recently learned, a large amount of more complex organic compounds. These organic compounds may be limited to a mixture of molecules such as the original Miller - Urey experiment was able to produce, or they may be even more closely related to life; we can't be sure from here, yet. In the interior of a comet, under layers of opaque organic material, viable cells would be shielded from radiation. Of course, freezing slows or stops metabolism, so cells could exist there in suspended animation. A few larger comets such as Halley's comet have orbits that bring them as close to the sun as Earth is. Even fewer comets, called "sungrazers," actually strike the sun, or pass so close that they are destroyed by it. Most comets reside at distances far beyond that of Pluto, in orbits not confined to the plane in which the planets' orbits lie. They are so numerous that the total mass of comets in solar orbit may be as great as the total mass of the planets. Slight gravitational disturbances caused by the outer planets or neighboring stars can change a comet's orbit completely, steering some closer to the sun, others completely away. When a comet nears the sun, some of its surface material ablates away, making the comet's "tail." This process usually begins somewhere between the orbits of Jupiter and Mars. Some of the discharged material is gas, some of it is dust. Each makes a different kind of cometary tail. Dust and larger debris left by comets remain for a while in solar orbit. Earth often passes through the orbits of cometary debris, causing meteor showers such as the Perseid meteor shower around August 10 every year, when we cross the orbit of comet Swift-Tuttle. Thousands of tons of cometary dust, debris and larger fragments fall to Earth every year. Starting in the late 1960's, U.S. military intelligence observers doing surveillance against enemy missile attacks began to observe and photograph comets and other objects as big as thirty to fifty meters in diameter exploding in the upper atmosphere. From 1975 to 1992, 136 such objects were observed — about eight per year. That information was kept classified until 1993-1994 (5.5). It's worth remembering that four billion years ago, when life on Earth first appeared, the number of comets nearing the sun was hundreds or thousands of times greater than it is now (6). The study of comets today is rich with surprises. For example, comet Hyakutake, which was easily visible to the naked eye in March, 1996, was first discovered by a Japanese amateur astronomer using binoculars. Astronomers were surprised to learn "Hyakutake contains abundant ethane and methane, compounds never before confirmed in comets" (7-9). On March 27, 1997, NASA announced that a year-long study using Hubble and several Earth-based telescopes shows that the trace ices in the nucleus of comet Hale-Bopp are somehow segregated from water-ice (10). And on April 21, 1997, astronomers on the Canary Islands reported that Hale-Bopp has a third tail of a kind not seen before; it is composed of sodium gas (11). Following so many new findings, comet theorists are completely rethinking how comets are formed and what they contain. Perhaps in the process they should consider biological causes for some of the unexpected phenomena. For example, on Earth, ethane comes from methane, and methane is made from carbon dioxide by bacteria. This process could happen on comets as well. Many objects that fall into Earth's atmosphere from space are destroyed by heat before they reach Earth's surface. Only the very largest objects have enough momentum to penetrate the atmosphere without slowing down much. The largest comets are in this category. Imagine the fate of living cells deeply embedded in the ice of a large comet. The high heat requirement to melt ice, and water's extremely high heat of vaporization could offer some protection to the cells during a fast trip through the atmosphere. And landing in the ocean would soften the impact. Still, the heat generated by such explosions can be enormous. Christopher Chyba, Paul Thomas, Leigh Brookshaw and Carl Sagan wrote a study of this problem, published in Science in 1990, entitled "Cometary Delivery of Organic Molecules to the Early Earth" (12). They carefully calculate the heat generated by high speed impacts with Earth, and then conclude that life's building blocks (not whole cells) could arrive intact. It is reasonable to extend their conclusion to cells, by expanding the scope of their study. Chyba and his coauthors in 1990 admittedly do not examine the case of a comet exploding before impact. However most comets, indeed most large meteoroids of any type except iron ones, would explode before impact. 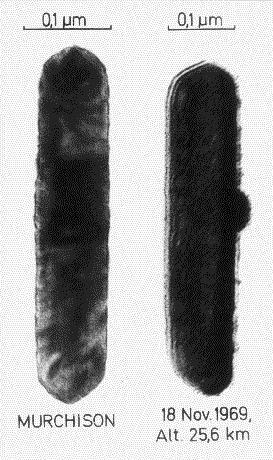 In 1992 Chyba and Sagan (13) did address the explosion of comets in the atmosphere and found that for the delivery of intact organic compounds at least, this method of transfer was far more effective than comets that collide with the surface. The best known atmospheric explosion of a meteoroid happened eight kilometers above Tunguska in central Siberia on June 30, 1908. The explosion flattened the forest for roughly 15 kilometers in every direction. The object was most likely an asteroid, perhaps 60 meters in diameter, because a comet would have exploded higher in the atmosphere. Our knowledge of this event is indirect because no one investigated the site until twenty years after the explosion (14). A similar atmospheric explosion, again over Siberia, occurred in 1947. We know that atmospheric explosions before impact by comets and asteroids are common. An explosion in the air would be much gentler than a collision with either Earth's hard surface or the ocean. Matter on the trailing side of a comet exploding in the atmosphere would be significantly slowed by the jolt. And matter located there would also be the best protected from the heat generated during atmospheric entry prior to the explosion. In March 1965, an object estimated at 7 - 8 meters in diameter exploded 30 kilometers over Revelstoke, Canada. This time investigators arrived promptly and recovered many fragments a few millimeters in size. Most of these were not altered by heat, proving that a plausible delivery mechanism for cells exists (15). There are, as we see, several plausible methods of delivering cells in comets from space to Earth. Of course, our case for the presence of bacteria in comets would be stronger if we could actually find on Earth fossilized bacteria in a meteorite that came from a comet. Is this possible? Not all meteorites were necessarily ever embedded in comets. Most meteorites appear to be fragments of more solid objects such as asteroids or even other planets. However, a minority of meteorites, about 4 percent, are different from the rest. They are called carbonaceous chondrites. They contain a much higher percentage of carbon, from .35 percent to 4.8 percent versus a mean of .1 percent for ordinary meteorites. Their chemical composition makes them more susceptible to destruction by heat; the proportion of them entering the atmosphere may be as high as 50 percent (18). We know from the recovered fragments that the object that exploded over Revelstoke, for example, was a carbonaceous chondrite. Among astronomers there are several theories about how carbonaceous chondrites came to be different (19). Recently scientists have determined that "salt-rich fluids analogous to terrestrial brines" flowed through the veins found in them (20), and that they were formed very early in the development of the solar system (21). The most accepted theory today is that they are remnants of spent comets. It is well known that carbonaceous chondrites contain a variety of organic compounds, including some of life's amino acids. Even more interesting is the evidence that, according to some scientists, several of them contain fossils resembling cells. In 1961, George Claus and Bartholomew Nagy (22) reported finding things resembling biological cells in two carbonaceous chondrites, the Orgueil and Ivuna meteorites. After discussion with other scientists, they concluded, "we are of the opinion that the organized elements are microfossils apparently indigenous to the meteorite parent body" (23). Harold Urey, of the famous experiment, accepted their conclusion (24, 25). At that time, Urey believed that the meteorites had come from the moon and were evidence of life or former life there. Consequently, NASA decided that the astronauts of the 1969 Apollo 11 and Apollo 12 missions to the moon would have to endure three weeks of quarantine in Houston upon their return. By 1975, however, Nagy was no longer sure that the objects he and Claus had seen were extraterrestrial microfossils. In 1982, now looking at traces of amino acids from the Murchison meteorite, Nagy was cautious and noncommittal as to where they came from. On the morning of September 28, 1969, a carbonaceous chondrite fell near Murchison, Victoria, Australia. The parent object disintegrated in the air and scattered fragments over an area of about five square miles. Scientists from NASA analyzed some of the fragments and determined that they contained organic molecules which "seem to have been formed before the meteorites reached the Earth" (26). The researchers took care to assure that the organic contents were not Earthly contaminants. Nearly ten years later, German geologist and paleontologist Hans Dietrich Pflug also examined fragments of the Murchison meteorite. Using a new and difficult technique with the fragments, he isolated and photographed some startling things. The photographed forms resemble fossilized cells and virus particles. Pflug considered the arguments for and against Earthly contamination as the source for the fossils and is convinced that the fossils came from space (27). But he is officially noncommittal as to whether they are actually what they look like — cells and virus particles. "There is no convincing evidence that the forms are more than 'organized elements,' possibly some kind of prebiotic structures," he now says. Today the consensus is that all such fossils are Earthly contaminants, but the case is not settled. More research is needed. Recently, new and better methods to conduct this kind of research have been developed by NASA researchers examining the meteorite from Mars designated ALH 84001. Fortunately, similar methods are now being applied to the Murchison meteorite, and the preliminary results are startling. 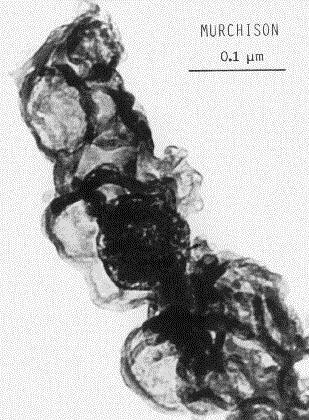 Pictures made available in July, 1997, show microscopic forms in Murchison that look very lifelike (27.5). Most of the debris that comets shed is a fine dust. In fact, dust is the form in which the greatest volume of organic compounds is delivered to Earth; far more arrives that way than in larger meteorites or the largest impactors such as whole comets (28, 29). The fate of tiny dustlike particles falling to Earth is very different from that of larger objects. The effect of the thin upper atmosphere on particles as fine as single spores or viruses as they enter it at high speed can be to slow them while heating them only mildly, for only a few seconds. Hoyle and Wickramasinghe calculated that a particle the size of a typical bacterium might get briefly heated to 500 degrees C. They then cite studies in which E. coli were subjected to close to twenty seconds of flash heating of up to 700 degrees C and survived (30). E. coli do not normally live in a hot environment; they live in our intestines. There are archaebacteria, however, that thrive at well above the boiling point of water, and many bacteria form heat-resistant spores. It is reasonable to assume that the sporulated forms of some of these could survive flash heating even better than normal E. coli can. "In almost all kinds of cells subject to heat shock, certain proteins (about 17 in E. coli) begin to be made much faster than usual.... Remarkably, some heat-shock proteins of widely different species are closely related; in fact, there are even similarities between those of bacteria and those of eukaryotes.... [W]e have no idea what function they have in common that is essential to save cells from the rigors of a sudden temperature rise...."
After being released as dust by a comet, before entering the atmosphere, bacteria would be subject to radiation damage for a short while at least. Interestingly, certain bacteria, such as Deinococcus radiodurans, can survive a dose of nuclear radiation 3,000 times stronger than the dosage that would kill a human (32). There has never been radiation that strong on Earth. If life originated here from nonliving chemicals, and if evolution works according to the darwinian paradigm, the evolution of that survival capability is hard to explain. In fact, Dr. Kenneth Minton, one of the scientists who studied these bacteria, said, "Deinococcus radiodurans would be a good vector for panspermia" (33). When a typical comet nears the sun, it vents gases and dust from various places. This has been thought to happen because the sun's heat on the comet's irregular surface causes cometary material to boil off asymmetrically. However, some comets like Chiron and Schwassmann-Wachmann 1 exhibit unusual behavior; they sputter and brighten too far from the sun for this mechanism to work (34-37). Hale-Bopp is another comet in this category (38). Even Halley's comet had an unexpected outburst in 1991; it brightened by a factor of 300 while it was outbound and well beyond the orbit of Saturn. The strictly chemical explanations of these anomalous events rely on processes that would run out of supplies within a few hundred years. M. K. Wallis and Wickramasinghe (39) proposed another explanation; namely, that a cycle of surface freezing, compression, and cracking may cause compressed liquid or gas to squirt from a comet's interior. A third possibility, which Hoyle and Wickramasinghe have considered, is that cellular metabolism may be under way on some comets. This metabolism could generate gasses that could, directly or indirectly, account for the brightening. The recent discovery of abundant methane and ethane in the coma of comet Hyakutake (40) strengthens this possibility. In any case, the anomalous brightening of these comets needs explaining. The presence of liquid water or even life on the comets could help explain it. More research would help here as well. 28 Sep 2018: New research makes panspermia more likely. On the origin of molecular oxygen in cometary comae by K. L. Heritier et al., Nature Communications, 03 Jul 2017. 'Oumuamua Was a Comet After All by Javier Barbuzano, Sky & Telescope, 27 Jun 2018. 12 Jan 2018: ...the organic matter originated from ...an ocean world in the early solar system, possibly Ceres. 29 May 2017: Microrganisms on ISS? The Chemical Composition of an Extrasolar Kuiper-Belt-Object by S. Xu et al., 836:L7, The Astrophysical Journal Letters, 10 Feb 2017; and commentary: Dwarf Star 200 Light Years Away Contains Life's Building Blocks, University of California Los Angeles (+Newswise), 10-13 Feb 2017; and: Hubble Witnesses Massive Comet-Like Object Pollute Atmosphere of a White Dwarf, Space Telescope Science Institute, 09 Feb 2017. Perspectives on Comets, Comet-like Asteroids, and Their Predisposition to Provide an Environment That Is Friendly to Life by Katharina Bosiek et al., doi:10.1089/ast.2015.1354, Astrobiology, Mar 2016. Marina Frontasyeva and Richard Hoover send a paper about nano-metric dust in interplanetary clouds, 16-17 Jan 2016. Ethyl alcohol and sugar in comet C/2014 Q2 (Lovejoy) by Nicolas Biver et al., Science Advances, 2 Oct 2015. Milton Wainwright, "...Prescient words on comets and life," doi:10.1038/516329a, p 329 4 506, Nature, 18 Dec 2014. Comet dust found in Antarctica by Ilima Loomis, Science, 5 Dec 2014. Results of Observations in January 2014 of a meteor shower of Comet C/2012 S1 (ISON) re: research by Chandra Wickramasinghe, posted by Bill Smith, 10 Aug 2014. ASU scientists strike scientific gold with meteorite (re: Organics in Sutter's Mill meteorite) by Jenny Green, Arizona State University (+Newswise), 10 Sep 2012. Two Solar System Puzzles Solved, Carnegie Institution of Washington, 25 Jul 2012. Michael J. Mumma and Steven B. Charnley, "The Chemical Composition of Comets—Emerging Taxonomies and Natal Heritage" [abstract], doi:10.1146/annurev-astro-081309-130811, p471–524 v49, Annu. Rev. Astron. Astrophys., 2011. 15 May 2012: : The Sutter's Mill meteorite boomed and streaked brightly ...Sunday 22 April. 11 Mar 2012: Although we've found amino acids in carbon-rich meteorites before, we weren't expecting to find them in these specific groups, since the high temperatures they experienced tend to destroy amino acids — Dr. Aaron Burton, NASA. 27 Oct 2011: Theoretically, this is impossible, but observationally we can see it happening, says Professor Sun Kwok. Paul Hartogh et al., "Ocean-like water in the Jupiter-family comet 103P/Hartley 2" [abstract], doi:10.1038/nature10519, Nature, online 5 Oct 2011. First comet found with ocean-like water, EurekAlert, 5 Oct 2011. Michael F. A'Hearn et al., "EPOXI at Comet Hartley 2" [abstract], doi:10.1126/science.1204054, p1396-1400 v332, Science, 17 Jun 2011. 19 Jun 2011: A young star is seen spewing jets of water into space, according to the European Space Agency. 13 Jun 2011: Fragments of the Tagish Lake meteorite contain amino acids that are predominantly left-handed, as in life. Kenneth Augustyn sends a link to an article in National Geographic News, 21 Dec 2010. Life's Building Blocks Found on Surprising Meteorite, Space.com, 16 Dec 2010. 31 Oct 2010: A layer of organic compounds may give Kuiper-Belt objects their colors. A comet's tale of life on earth, SpectroscopyNow, 15 Sep 2010. J. L. Elliot et al., "Size and albedo of Kuiper belt object 55636 from a stellar occultation" [abstract], doi:10.1038/nature09109, p897-900 v465, Nature, 17 Jun 2009. "...Either KBO 55636 has an active resurfacing mechanism, or... fresh water ice can persist for billions of years in the outer Solar System" (from Editor's summary, p841). 10 Jun 2010: Anyone who has seen a long tail comet in the night sky may be looking at material from another star. Asteroid ice hints at rocky start to life on Earth, doi:10.1038/news.2010.207, by Zeeya Merali, NatureNews, 28 Apr 2010. 12 Jan 2010: Comets and the Origin of Life, by Wickramasinghe, Wickramasinghe and Napier. Alien Gases in Our Atmosphere by Phil Berardelli, ScienceNOW Daily News, 10 Dec 2009. Crashing comets not likely the cause of Earth's mass extinctions by Vince Stricherz, University of Washington News, 30 Jul 2009. 30 Jul 2009: Comets contained oceans of liquid water during the first million years of their formation. D. Hutsemekers et al., "New constraints on the delivery of cometary water and nitrogen to Earth from the 15N/14N isotopic ratio" [abstract], arXiv:0906.5221v1 [astro-ph.EP], online 29 Jun 2009. Meteorite bombardment may have made Earth more habitable, says study, by Colin Smith, EurekAlert!, 1 Jun 2009. NASA Study Shows Asteroids May Have Accelerated Life on Earth, by Dwayne Brown and Jim Scott, NASA News Release 09-111, 20 May 2009. Why Comets Are Dirty, by Phil Berardelli, ScienceNOW Daily News, 14 May 2009. We Owe It All to Comets, American Friends of Tel Aviv University, 28 Apr 2009. Comet Dust Reveals Unexpected Mixing of Solar System, by Jill Sakai, the University of Wisconsin-Madison, 18 Sep 2008. A web story about the Desaguadero Meteorite is the subject of a Reply from Ron McGhee, 15 Mar 2008. 14 Mar 2008: Meteorites with the highest observed concentrations of amino acids have been examined at the Carnegie Institution. Peru meteorite may rewrite rule books, by Maggie Fox, News in Science, the Australian Broadcasting Corporation, 12 Mar 2008. Mixing It Up in the Early Solar System, by Richard A. Kerr, ScienceNOW Daily News, 25 Oct 2007. "But Ciesla performed more computationally demanding, two-dimensional simulations. In these, most nebular material still flows inward toward the sun; but near the midplane, the inward flow ceases or even reverses, letting the outward diffusion of material to the comet-forming region proceed." 20 Sep 2007: A meteorite caused illness in Peru? Janaki Tara Wickramasinghe, The Role of Comets in Panspermia, PhD Thesis, Cardiff University, 25 May 2007. Edward M. Drobyshevski, "Stardust findings favor not only the planetary origin of comets but the underlying close-binary cosmogony of the Solar system as well" [abstract], astro-ph/0702601, arXiv.org, 22 Feb 2007. "...Findings of the Stardust mission that brought to the Earth dust from the 81P/Wild 2 coma.... are at odds with the widely accepted condensation/sublimation comet paradigm. They fit rather well to the approach assuming ejection of nuclei of short-period comets from moon-like bodies of the type of Galilean satellites in rare (six to seven events in 4.5 aeons) global explosions of their massive icy envelopes." Dust around nearby star like powder snow, by Robert Sanders, UC Berkeley News, 8 Jan 2007. Dante S. Lauretta and Harry Y. McSween, eds., Meteorites and the Early Solar System II, ISBN:978-0-8165-2562-1, The University of Arizona Press [publisher's promo], 2006. 1 Dec 2006: It's not from around here. It's from somewhere else. — Mike Zolensky talking abut the Tagish Lake meteorite. Pre-life Molecules Are Present in Comets, University of Michigan, 21 Jul 2006. Fossil Meteorite Unearthed From Crater, Linda M. V. Martel, Planetary Science Research Discoveries, 14 Jun 2006. 9 May 2006: Organic matter in meteorites is extraterrestrial and ancient. 24 Apr 2006: Pristine samples of the Tagish Lake meteorite now belong to Canadian curation and research facilities. 22 Dec 2005: Building blocks of life orbiting a Sun-like star were observed by astronomers using NASA's Spitzer Space Telescope. Organic chemistry in meteorites, comets and the interstellar medium, abstract by Oliver Botta, International Space Science Institute, presented at IAU Symposium 231, 2 Sep 2005. 4 Nov 2005: Hyperion's craters look like vents to us. Comet Hale-Bopp, photographed March 1997, Astronomy Picture of the Day, 22 May 2005. NASA's Deep Impact spacecraft spots its quarry, Jet Propulsion Laboratory, 27 Apr 2005. 11 Apr 2005: There's an unexplained brown stain in the Genesis science canister. Comet strike surprisingly more likely, Cardiff University, 26 Oct 2004. Rob Sheldon emails about evidence for liquid water on comets, 25 Oct 2004. Scientists Say Comet Smashed Into Southern Germany In 200 BC [posted on SpaceDaily], Agence France-Presse, 15 Oct 2004. Associated Press, "Comet Research Pioneer Whipple Dies" [text], The New York Times, 31 Aug 2004. ...Comet Wild 2 unlike any other body in solar system, EurekAlert!, 17 June 2004. Did comets flood Earth's oceans? re: Ptolemy, an instrument on Rosetta's Philae lander, European Space Agency, 16 June 2004. Comet Hale-Bopp Over Indian Cove, Astronomy Picture of the Day, 20 Apr 2004. 4 Feb 2004: A small comet impact caused sixth century global chill? Eberhard Grün, Bo Å. S. Gustafson, Stan Dermott and Hugo Fechtig, eds., Interplanetary Dust, Springer-Verlag, Berlin, Heidelberg, New York, 2001. Carbon clue implies comets orbit other stars, NewScientist.com , 12 Dec 2003. Optical Detection of Anomalous Nitrogen in Comets, ESO Press Release 25/03, European Southern Observatory, 12 Sep 2003. Too few icy rocks to explain comets, NewScientist.com, 3 Sep 2003. Alan Stern, "The evolution of comets in the Oort cloud and Kuiper belt" [abstract], p 639-642 v 424 Nature, 7 Aug 2003. Catching a Comet's Tail in the Earth's Upper Atmosphere, News Release J03-80, Johnson Space Center, 10 Jul 2003. Very Large Meteorite Fell Down in Siberia, Pravda, 18 Mar 2003. 2002, December 11: Tagish Lake meteorite has unfamiliar organic globules. 2002, November 4: Bacteria can survive high-speed impacts. First Evidence For Early Meteorite Bombardment Of Earth, SpaceDaily, 26 Jul 2002. Rare space rock 'a gem' re: Tagish Lake meteorite, BBCNews, 22 Jul 2002. Kenneth Chang, "Abundance of Cometlike Objects With Moons Stuns Experts" [text], The New York Times, 23 Apr 2002. Aged and Wounded Spacecraft Photographs Comet, Space.com "Special Report" with links to half-a-dozen stories about Comet Borrelly, Sep - Nov 2001. Comet's black heart revealed, by Jeff Hecht, New Scientist, 30 Nov 2001. "Complex organics are the best suggestion for the dark surface material." Serving Up Meteorites on Ice, re: meteorites in general, by Linda M.V. Martel, Hawai'i Institute of Geophysics and Planetology, 7 Nov 2001. Carbonaceous Clues to the Early Solar System, re: Tagish Lake meteorite, by Leslie Mullen, NASA's Astrobiology Institute, publicised 12 Oct 2001. Electa Draper, "Maybe it was meteors: Wildfire cluster probed" [text], Denver Post, 9 October 2001. 2001, September 29: Deep Space 1 photos comet Borrelly. Sandra Pizzarello et al., "The Organic Content of the Tagish Lake Meteorite" [abstract], p 2236-2239 v 293 Science, 21 September 2001. Meteorites Don't Pop Corn, by Toni Phillips, Science@NASA, 27 July 2001. "A fireball that dazzled Americans on July 23rd was a piece of a comet or an asteroid, scientists say." 2001, July 11: A dying star boils the comets around it. William J. Broad, "Military Warning System Also Tracks Bomb-Size Meteors" [text], The New York Times, 29 May 2001. As cool as the cosmos, by Duncan Steel, The Guardian, 3 May 2001. "Just-fallen meteorites... are cold." Do asteroids contain seeds of life?, ENN.com, 27 April 2001. Cosmic Impacts Punctuated Human Evolution, CCNet, 17 April 2001. 2001, April 6: Tagish Lake meteorite contains few amino acids. Was Johnny Appleseed a Comet?, Science@NASA, 5 April 2001 (Polypeptides produced in collision experiments). Deep Space 1 Loads up for Trek to Comet, JPL, NASA, 20 March 2001. 2001, March 19: Did a chunk of ice fall to Earth from a comet? 2001, February 26: Non-biological chemistry cannot produce the organic molecules in comets. Deep Space 1 Mission Log, by Marc Rayman, [updated] 15 February 2001. 2001, January 23: Japanese scientists have found 3,554 meteorites in Antarctica. Meteors come in with a bang, by Philip Ball, Nature Science Update, 5 January 2001. 2000, November 27: Leonid meteor reveals spectral signature of bacteria? 2000, November 14: Organics in Leonid Meteors. 2000, October 13: More about Tagish Lake meteorite in Science. 2000, August 31: Analysis of the Tagish Lake meteorite will be methodical. Hot X-rays from a Cold Comet, Science@NASA, 23 August 2000. 2000, July 19: Comets could have formed at different times during the evolution of the solar nebula, and may reveal their age by the structure of their dust grains. It came out of the sky re: Tagish Lake meteorite, by Duncan Steel, The Guardian, 29 June 2000. 2000, June 12: Salt in Zag meteorite suggests planets formed early in a warm wet place. 2000, June 1: Tagish Lake Meteorite is "equivalent to a sample-return space mission." Kenneth Chang, "Meteorite Offers a Primordial Peek" re: Tagish Lake [text], The New York Times, 2 May 2000. 2000, March 28: Shallow craters... cover the coastal plain of the southeastern United States. 2000, March 18: Pristine samples of January's Yukon meteorite (Tagish Lake). 2000, March 8: A carbonaceous asteroid was observed passing Earth. How Comets Might Seed Planets, by Robert Roy Britt, Space.com, 24 January 2000. 1999, November 29: Tunguska explosion probably caused by a comet. Life From a Dirty Snowball, NASA's Astrobiology Institute, November 1999. 1999, November 1: Comets' nuclei can be blacker than coal. Harvest of the heavens starts with a sludgeball on Earth by James Woodford, The Sydney Morning Herald, 24 September 1999. The house of comets by Wil Milan, Explorezone.com. 1999, September 7: Liquid water in another meteorite. 1999, August 27: Liquid water found in a meteorite. Robert S. Boyd, "Earth battered through history by comets," San Jose Mercury News, 17 August 1999. At age 92 astronomer Fred Whipple is joining NASA space team to explore three comets in 2002 — Cornell University News, 26 July 1999. 1999 July 7: A mission to excavate the interior of a comet has been selected by NASA's Discovery Program. ESA's Rosetta comet chaser unveiled in London — European Space Agency Info Note 09-99, 1 July 1999. Champollion Mission to Be Canceled — SpaceViews, 29 June 1999. Return to Tunguska, by David Whitehouse, BBC News Online, 28 June 1999. 1998, October 22: Comet Hale-Bopp shows amazingly strong activity 6.7 AU from the Sun. 1998, September 8: Fossilized magnetotactic bacterium identified in the Orgueil meteorite. 1998, March 21: There appear to be two distinct classes of Kuiper-belt objects, as distinguished by color. 1. Fred Hoyle and Chandra Wickramasinghe, Lifecloud: The Origin of Life in the Universe. Harper and Row 1978. 3. Jeff Secker, Paul S. Wesson and James R. Lepock, "Astrophysical and Biological Constraints on Radiopanspermia" p 184-192 v 90 n 4 Journal of the Royal Astronomical Society of Canada. August 1996. 4. Paul Parsons, "Dusting off panspermia" p 221-222 v 383 Nature. 19 September 1996. 5. Donald K. Yoemans, Comets. New York: Wiley Science Editions 1991. p 350. 5.5. William J. Broad, "Earth is Target for Space Rocks at Higher Rate Than Thought" p B9,B14, The New York Times. 7 January 1997. 6. Christopher F. Chyba, "Extraterrestrial amino acids and terrestrial life" p 113-114 v 348 Nature. 8 November 1990. 7. Michael Mumma et al., "Detection of Abundant Ethane and Methane, Along with Carbon Monoxide and Water, in Comet C/1996 B2 Hyakutake: Evidence for Interstellar Origin" p 1310-1314 v 272 Science. 31 May 1996. 8. Kim Peterson, "Hyakutake Produces Another Surprise" p 1263-1264 v 272 Science. 31 May 1996. 9. Ron Cowen, "Bright Comet Poses Puzzle: Hyakutake's tails of mystery" ScienceNewsOnline, June 1, 1996. 10. "Hubble and IUE Hale-Bopp Observations Surprise Astronomers, NASA News Release 97-55, March 27, 1997. 11. Malcolm W. Browne, "Hale-Bopp Has 3d Tail" p B11, The New York Times April 22, 1997. 13. Christopher F. Chyba and Carl Sagan, "Endogenous production, exogenous delivery and impact-shock synthesis of organic molecules; an inventory for the origins of life" p 125-132 v 355 Nature. 1992. 14. The Sibirian Center for Universal Catastrophe is a new resource on the Tunguska event. 15. Christopher F. Chyba, Paul J. Thomas and Kevin J. Zahnle, "The 1908 Tunguska explosion: disruption of a stony asteroid" p 40-44 v 361 Nature, 7 January 1993. 16. NASA newsrelease 97-112, 28 May 1997. 16.1. William J. Broad, "Tiny Comets May Have Big Impact" The New York Times, May 29, 1997. 16.2. see also NASA Sees Comets Entering Atmosphere, this website. 17. David W. Deamer and Gail R. Fleischaker, Origins of Life: The Central Concepts. Jones and Bartlett Publishers 1994. 18. Edward Anders, "Pre-biotic organic matter from comets and asteroids" p 255-257 v 342 Nature. 1989. 19. John G. Burke, Cosmic Debris: Meteorites in History. University of California Press 1986. p 304-307. 20. Ian D. Hutcheon, "Signs of an early spring," doi:10.1038/379676a0, p 676-677 v 379 Nature, 22 Feb 1996. 21. Magnus Endress, Ernst Zinner and Adolf Bischoff, "Early aqueous activity on primitive meteorite parent bodies," doi:10.1038/379701a0, p 701-703 v 379 Nature, 22 Feb 1996. 22. George Claus and Bartholomew Nagy, "A Microbial Examination of Some Carbonaceous Chondrites" p 594-596 v 192 Nature. 18 November 1961. 23. Bartholomew Nagy, George Claus and Douglas Hennessy, "Organic Particles embedded in Minerals in the Orgueil and Ivuna Carbonaceous Chondrites" p 1129-1133 v 193 Nature. 24 March 1962. 24. Harold C. Urey, "Origin of Life-like Forms in Carbonaceous Chondrites" p 1119-1233 v 193 Nature. 24 March 1962. 25. Harold C. Urey, "Biological Material in Meteorites: A Review" p 247-166 v 151 Science. 14 January 1966. 26. Keith Kvenvolden, James Lawless, Katherine Pering, Etta Peterson, Jose Flores, Cyril Ponnamperuma, I. R. Kaplan and Carleton Moore, "Evidence for Extraterrestrial Amino-acids and Hydrocarbons in the Murchison Meteorite" p 923-926 v 228 Nature. 1970. 27. Hans D. Pflug, "Ultrafine Structure of the Organic Matter in Meteorites" p 24-37 Fundamental Studies and the Future of Science, Chandra Wickramasinghe, ed. University College Cardiff Press 1984. 27.5. See Fossilized Life Forms in the Murchison Meteorite, this website. 28. Christopher Chyba and Carl Sagan, "Endogenous production, exogenous delivery and impact-shock synthesis of organic molecules: an inventory for the origins of life" p 125-132 v 355 Nature. 1992. 29. Edward Anders, "Pre-biotic organic matter from comets and asteroids" p 255-257 v 342 Nature. 1989. 30. Fred Hoyle and Chandra Wickramasinghe, Our Place in the Cosmos. J.M. Dent Ltd. 1993. p 79. 31. James D. Watson, Nancy H. Hopkins, Jeffrey W. Roberts, Joan Argetsinger Steitz and Alan M. Weiner, The Molecular Biology of the Gene, 4th edition. Menlo Park, California: The Benjamin/Cummings Publishing Company, Inc. 1987. p 485. 31.5. Farajollah Maleki, Afra Khosravi, Ahmad Nasser, Hamid Taghinejad, and Mitra Azizian, "Bacterial Heat Shock Protein Activity," doi:10.7860/JCDR/2016/14568.7444, J Clin Diagn Res., Mar 2016. 32. Michael J. Daly and Kenneth W. Minton, "Resistance to Radiation" p 1318 v 270 Science. 24 November 1995. 33. Malcolm W. Browne, "Odd Microbe Survives Vast Dose of Radiation" p C1,C5 The New York Times 28 November 1995. 34. J. L. Elliot et al. (26 others). "Jet-like features near the nucleus of Chiron" p 46-49 v 373 Nature. 5 January 1995. 35. Ron Miller, and William K. Hartmann, The Grand Tour: A Traveler's Guide to the Solar System. Workman Publishing 1993. 36. Matthew C. Senay and David Jewitt, "Coma formation driven by carbon monoxide release from comet Schwassmann-Wachmann 1" p 229-231 v 371 Nature. 15 September 1994. 37. Alan S. Stern, "Chiron illuminated" p 23-24 v 373 Nature. 5 January 1995. 38. Nicolas Biver et al., "Substantial outgassing of CO from comet Hale-Bopp at large heliocentric distance" p 137-139 v 380 Nature. 14 March 1996. 39. M. K. Wallis and N. C. Wickramasinghe, "Comet Halley's Remote Outburst" p 228-230 v 112 The Observatory. 1992. 40. Douglas Isbell and Jim Sahli, "Chemical Measurements of Comet Hyakutake Suggest a New Class of Comet" release 96-108 NASA HQ Public Affairs Office. 31 May 1996. M. E. Bailey, S. V. M. Clube and W. M. Napier, The Origin of Comets. Oxford: Pergamon Press 1990. William J. Broad, "The Comet's Gift: Hints of How Earth Came to Life" p B9,B12 The New York Times April 1, 1997. William J. Broad, "Spotlight On Comets In Shaping of Earth" p B7,B11 The New York Times June 3, 1997. Christopher F. Chyba, "Catastrophic impacts and the Drake equation" p 157-164. Michael J. Mumma, "Organics in comets" p 121-142. Juan Orò and Cristiano B. Cosmovici, "Comets and life on the primitive Earth" p 97-120. Roland Meier et al., "Deuterium in Comet C/1995 01 (Hale-Bopp): Detection of DCN" p 1707-1710 v 279 Science. 13 March 1998. "The observed values... imply a kinetic temperature above 30 K in the ... interstellar cloud that formed the solar system." Bartholomew Nagy, Carbonaceous Meteorites, Elsevier Scientific Publishing Company 1975. William R. Newcott, "The Age of Comets" p 94-109 v 192 n 6 National Geographic, December, 1997. Paul J. Thomas, Christopher F. Chyba and Christopher P. McKay, eds., Comets and the Origin and Evolution of Life. Springer-Verlag, New York, Inc. 1997. The Leonid Sample Return Mission from Space Science News at Marshall Space Flight Center, 16 November 1998. Chemical Measurements of Comet Hyakutake Suggest a New Class of Comets: News release 96-108 from NASA JPL. Meteorites and Comets: Organic Matter and Exobiological Hypotheses, 1834-Present: a large, categorized, annotated bibliography in "The Net Advance of Physics" by N. Redington and K.R. Keck at MIT. SpaceViews: Comet Hale Bopp. SpaceViews is a monthly publication of the Boston chapter of the National Space Society. Stratospheric Dust: part of Planetary Materials Curation at NASA JSC. NASA researchers: Comet shower triggered life on Earth by Don Knapp on CNN Interactive, April 17, 1997. Comets, maintained by Ron Baalke, JPL, NASA. Comets, one of Bill Arnett's Nine Planets, an excellent resource. The Comet Hale-Bopp Home Page at NASA's Jet Propulsion Laboratory, Pasadena, CA, contains more than 3,200 images, including one obtained by a California astronomer the night after the comet was discovered in July 1995. The Near-Live Comet Watching System at NASA Headquarters, Washington, DC, contains more than 1,300 images. Astronomers from Australia, Asia, Europe and the Americas have submitted images, which have been captured by everything from professional observatory equipment to the backyard gear of an amateur astronomer. The archives include photographs of the comet over San Francisco; Dublin, Ireland; and Genoa, Italy. UMass Astronomers Report Comets May Have Introduced Interstellar Chemicals to Earth by Arthur Clifford, University of Massachusetts Amherst, 9 October 1996. SKY Online's Comet Page by Sky Publishing Corporation, 1998.